Another Pit Bull has been involved in an animal cruelty case. This one, in Pennsylvania, involves someone dumping a dead Pit Bull alongside a Hampden Township walking trail. The dog has injuries which are apparently ‘consistent with dog fighting’. The Humane Society of Harrisburg is seeking a “person of interest” related to a dead pit bull found December 24 on a walking trail along the Conodoguniet Creek in Hampden Township. A jogger contacted the Humane Society after media reports about the incident and claimed he saw the man who dumped the badly injured dog. The dog had sustained broken legs and feet, a crushed trachea and lacerations on its legs — injuries consistent with dog-fighting, according to the Humane Society. It was wrapped in a blue vest that appeared to have been used as a gurney, according to the Humane Society. The jogger described the person of interest as a white male, 6’2″ to 6’4″, medium-length blondish-red hair and round glasses. The jogger said the person had at least five other dogs with him, including a yellow Labrador Retriever. The Humane Society of Harrisburg Area is seeking this man, described by a jogger who claims to have witnessed him dumping a dead pit bull on a walking trail along the Conodoguinet Creek on December 24 in Hampden Township. 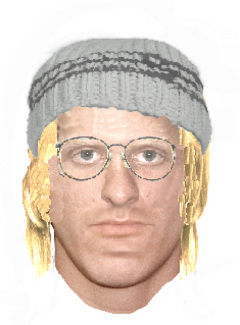 The accompanying sketch of the possible culprit has been released. A later story states that the “Humane Society of the United States” is offering a $2,500 reward for tips leading to the “identification, arrest and conviction” of those responsible for the dog’s death. The phone number, however, is still that of the Humane Society of Harrisburg, so I’m not really sure who it is that’s offering the reward. I suppose it doesn’t really matter, so long as the scumbag gets caught, but it would be nice to make sure the correct group is getting credit for having offered it. Anyone with information about the case is asked to call the Humane Society at 717-564-3320, ext. 104.